Please note: Every finishing batch may vary slightly in color. 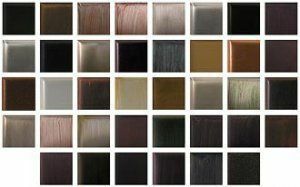 Under normal lighting situations, these color variances may be virtually undectable. However, we recommend you order all the pieces you will need at the same time to insure the closest color match. Custom Finish sample chips in 38 finishes for $3.00 each which includes shipping and handling. 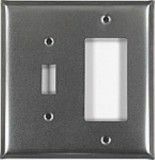 All our switchplates are mid-sized and a bit larger than the standard size. With the corner designs they can be an additional 1/4 inch larger, so please click the link for switchplate sizes to make sure they will fit Switchplate Sizes as there is a restocking fee on these custom finished switchplates. Your samples are shipped out in 24 hours by the US mail. 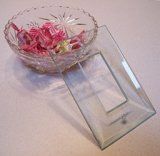 Finished products are custom made to order, and delivery in 3-4 weeks. Delivery of Custom finished products do take 3-4 weeks.